I know it's pretty hard to tell, but this is my big brother behind me on a suburban road leading to my home. I was forced to take the shot on my cellphone as I didn't have my camera with me. But at least when I got home I could remedy that. And it was WORTH taking the shot. 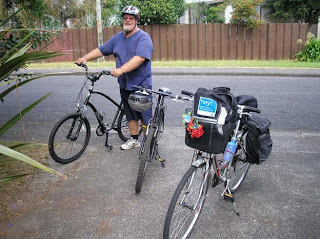 Helen (sister) and I headed up to Whenuapai Air Base and beyond this morning, hoping to catch my brother on a day off, and do some cycling with him. He'd recently bought a bike, and was doing a few circuits of Herald Island and beyond with his eldest daughter Nicola. When we got there, we were told he was 'dead to the world' having finished night shift an hour previous to our arrival. So we cycled 14 kms of the area and headed home. At lunchtime I heard from him, and he said he and Nicola were loading up their bikes and coming my way. SO I barely had time to down tools and prepare for more cycle action. It's just as well I'm a freelance artist working from home some days! We left the Peninsula and headed along my favourite route to Henderson, which is mostly bike path on rolling green hills beside a stream. Lovely. Niece and bro really enjoyed it, and niece will be bringing my delightful great nephews for a cycle along the same spot. 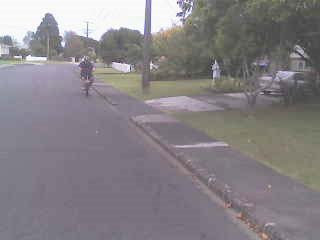 Had to hurry home, and then she scurried off to pick the boys up from school, while bro and I showed off his bike to other sister, who lives across the road from me. 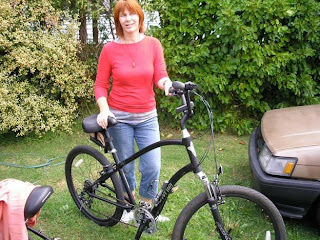 She was most impressed with his 'easy rider' cycle. A smooth ride and leaning back, which can be a bit hard on the hills. Here's almost every style of bike represented on the front lawn. 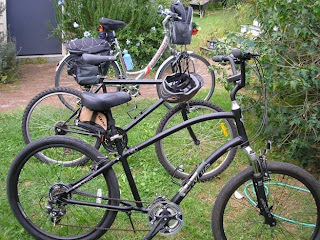 Mine, of course, is the heavily laden one with panniers and basket. VERY useful as was found, for carrying keys, purses and the odd spanner. 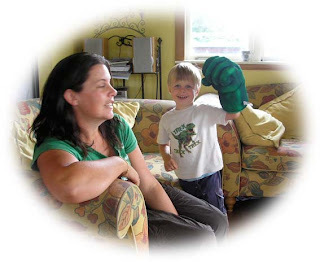 Youngest of niece's sons shows off Incredible Hulk glove, when she arrived to pick up bikes and father. And they were off. Great fun.